Best Activities in Martinique: Tours and More! Martinique tours, snorkeling and scuba diving, beaches, parks, museums and sports are all abundant on this beautiful Caribbean island paradise. Whether arriving via cruise ship, or staying at one of the beautiful resorts, you will find the many and diverse tours among the most popular activities in Martinique. Taking one of the many Martinique tours of this Caribbean island's rum (or rhum) distilleries is a fun way to spend a few hours, if I do say so myself. Martinique is often referred to as the "Rum Capital of the World," a title that is well deserved. There are 11 distilleries on the island, which produce almost 20 varieties of rum. Many, if not most, of these distilleries offer tours. These tours are some of the most popular activities in Martinique (especially the ones offering a free sampling of their wares!). The two listed below are among my favorite. At the Depaz Distillery (established in 1651) is housed in a rebuilt building at the foot of a volcano, Mt. Pelée. These self-guided tours here are free of charge, and not only will you get to see the fields of rare blue sugar cane, an art gallery with works created from distillery machinery and wooden rhum casks, and the workers unique housing, you will get to enjoy samples of the fermented end product! Depaz Rhum Distillery is open weekdays (Monday through Friday) from 9AM to 5PM, and Saturday from 9AM to 4PM. 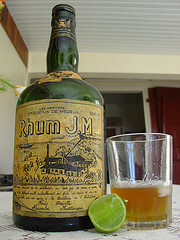 Visiting the JM Distillery, is also a terrific Martinique tour. It is located in a valley at the bottom of Mt. Pelée and is one of the very last "traditional" distilleries on this beautiful isle. This is the smallest distillery on this Caribbean island, The first glance of this popular distillery is from above. As you approach, the beautiful white structures with red metal roofs provide a stark contrast to the lush green vegetation that surrounds the facility. They offer tours of the banana and pineapple groves in addition to the sugar cane fields on the side of the volcano. While you can only witness the cane being carted down the mountain during cutting season (a practice unique to the JM Distillery), you can sample its fine wares all year around. JM Distillery is open weekdays (Monday through Friday) from 9AM to 5PM, and Saturday from 9AM to 1PM. While the distillery tours offer a small glimpse of the local flora, the many tours of the lush gardens on this island top the list of activities in Martinique. Among the most popular is the Céron Plantation (also know as Habitiation Céron). You can find this former sugar plantation on the Caribbean side of the island on the northernmost coast (25 miles from Fort-de-France). With Creole women wearing traditional clothing traversing this plantation and the remnants of the original mill, you get a glimpse into the colonial history of Martinique. .). Depending on your taste, you can also ride all-terrain-vehicles or horses through the trails of the gardens. The telephone number is: +596 52-94-53. Céron Plantation is open daily from 9:30AM to 5PM. Aqualand is a wonderful, refreshing North American style water park located in the town of Carbet (which is an one-hour drive north from Fort-de-France. It covers a land area of nearly 10 acres. There are activities designed for kids of all ages, from the young to the young at heart. Perhaps the most famous ride is the Giant Slalom, with hair-raising hairpin turns. My personal favorite, though, is the Black Hole ride. As the name suggests, you find yourself in complete darkness for most of the ride. The food is also great here, with the crepes being the standout option. Aqualand is open daily from 10AM to 6PM.